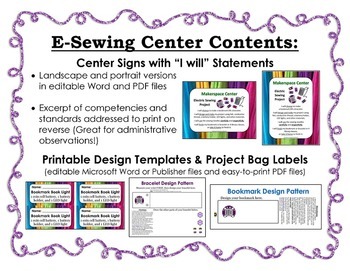 This center is designed for school library use, but can be used just as easily in a science classroom, computer lab, or family consumer science class. Encourage your students to develop problem solving and critical thinking skills while having fun and being creative! 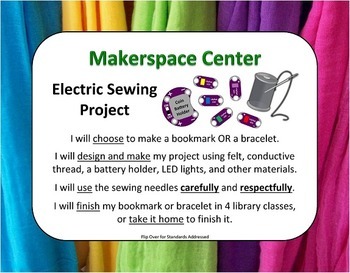 Students have the choice of making a book light bookmark or a light up, sparkling bracelet using LED lights, conductive thread for wire, and a sewable coin cell battery holder. 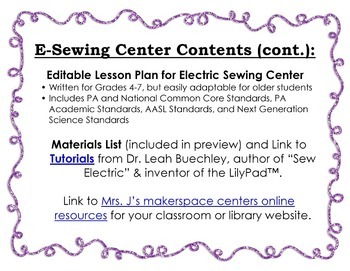 For the bracelet project, students may also have the option of using a sewable microcontroller to make the LED lights blink and flash. 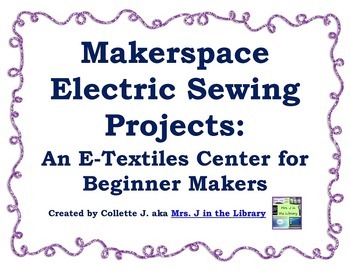 If you aren’t familiar with the maker movement or makerspaces (also called DIY spaces or hackerspaces), I’d recommend doing your own research on makerspaces and the Maker Faire. I’ve found the "Makerspace Playbook" by Make: Magazine to be very helpful.